PESHAWAR, Pakistan, Jul 9 2012 (IPS) - By ordering a ban on polio immunisation, in its strongholds along the Afghanistan-Pakistan border, the Taliban is holding up an ambitious global programme to rid the world of the crippling childhood disease, say World Health Organisation (WHO) doctors. “The Taliban’s ban on polio immunsiation in the Federally Administered Tribal Areas (FATA) poses a serious threat to the global polio eradication effort as countries declared polio-free long ago could import the virus from Pakistan,” Dr. Khalid Khan, who works for the WHO’s polio programme in the FATA, tells IPS. WHO leads the Global Polio Eradication Initiative (GPEI) which is supported by Rotary International, the Centres for Disease Control and Prevention in the United States and the United Nations Children’s Fund. Since GPEI’s launch in 1988 the number of polio cases worldwide has dropped to over 99 percent and today only three countries, Nigeria, Afghanistan and Pakistan, are classified as polio-endemic. But, of these remaining pools of the wild polio virus (WPV), the FATA is distinct for harbouring two strains, WPV1 and WPV 3. “FATA is the only polio-endemic region in the world which has WPV1 and WPV3 types of polio virus, and as long as these remain in circulation anywhere they are a threat to children everywhere,” says Asghar Ali, another WHO doctor. In 1994, the WHO’s Americas region (36 countries) was certified polio-free, followed by the Western Pacific region (37 countries including China) in 2000. But, after a gap of nine years, several polio cases linked to the WPV1 strain surfaced in China’s Xinjiang province which borders Pakistan. Similarly, the WHO European region (51 countries), polio-free since June 2002, suffered its first polio importation in 2010, underlining the threat from the highly contagious virus. According to the WHO, in the 2009-2010 period, 23 previously polio-free countries were re-infected with polio due to virus importation. Ali told IPS that most of the FATA, which consists of seven agencies, was vulnerable because vaccination coverage is less than 45 percent vaccination when the target set by the ‘Prime Minister’s Emergency Polio Eradication Plan 2012’ is 95 percent. The problem was worst in the North Waziristan and South Waziristan agencies of the FATA where the Tehreek-e-Taliban, or Pakistani Taliban, is entrenched. On Jun. 15, the Pakistani Taliban imposed a ban on oral polio vaccination (OPV), saying that it was part of a design by the United States to reduce Muslim populations. The Taliban in South Waziristan went a step further on Jun. 25 by ordering a blanket ban on an on all vaccinations. “The latest ban in the two militancy-riddled FATA regions is a serious setback to eradication efforts,” Ali said. “We have had troubles in the Khyber Agency, but as we were getting close to resolving the crisis there, this new blow to the programme from North and South Waziristan pops up,” Dr. Fawad Khan, director of health in the FATA, tells IPS. Since the beginning of the year, there have been 22 confirmed polio cases in Pakistan, with 11 reported from FATA. “We recently started a short interval additional dose programme to ensure that the children who missed the routine campaigns get OPV,” the FATA health director said. The Taliban alleges that vaccination programmes are a front for espionage and cites the case of Dr. Shakil Afridi, convicted for running a fake hepatitis immunisation programme to confirm the presence of Osama bin Laden in Abbottabad, where the Al-Qaeda chief was killed in a U.S. military raid in May 2011. Afridi was sentenced to 33 years in prison by a tribal court for his role in helping the Central Intelligence Agency of the U.S. in tracking down bin Laden, wanted for the Sep. 11, 2001, attacks on U.S. soil. “On the one hand they are killing innocent women, children and old people in drone attacks and on the other, they are spending millions on vaccination campaigns,” said the Taliban pamphlet. 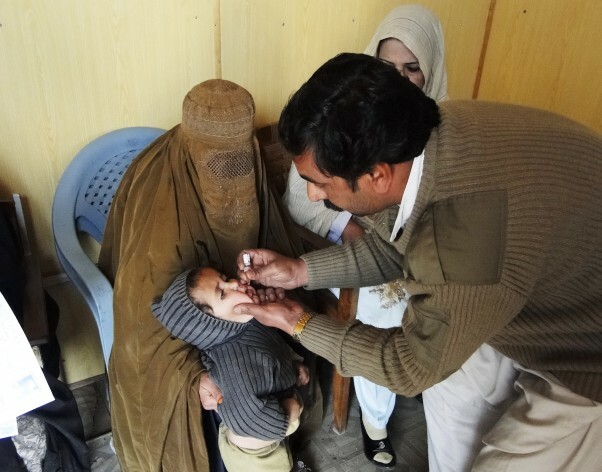 The ban will impact an estimated 318,000 children in the North and South Waziristan agencies, said Tahseenullah Khan, coordinator of the National Development and Research Foundation (NRDF) which has been assisting the government in promoting immunisation in the two agencies. Local religious leaders, who are members of the NRDF, had successfully addressed more than 6,000 cases of vaccination refusals by parents in both the agencies, but this time the situation is different, Tahseenullah Khan said. “This time, it will be difficult to convince the Taliban to allow vaccinations because they have also demanded cessation of drone strikes in exchange for lifting the ban,” said Dr. Aamir Khan of the government’s expanded programme on immunisation in the Khyber Pakhtunkhwa province.